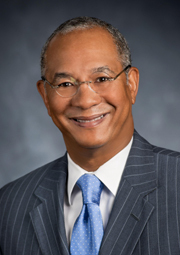 Washington, D.C. (October 30, 2017) — Carl S. Richie, Jr. Chairman of the Board, Housing Authority of the City of Austin, Texas (HACA), has been elected President of the National Association of Housing and Redevelopment Officials (NAHRO), the nation’s oldest housing and community development association. Richie was named President at the NAHRO National Conference and Exhibition in Pittsburgh, Pa. on October 29, and will serve in that position for the next two years. “I am honored to be elected NAHRO President and look forward to working with my colleagues across the country to advocate for the preservation and improvement of the housing programs that help so many working families, children, seniors, and persons with disabilities,” said Richie. “I also look forward to helping NAHRO better serve our residents and the professionals who serve them.” Richie also added that one of his top priorities will be bringing the concerns and issues of NAHRO’s members and residents to Congress and the U.S. Department of Housing and Urban Development (HUD). Carl is the first the first former public housing resident and Public Housing Commissioner to lead NAHRO. In addition to having resided in the Rosewood Public Housing Development in Wichita Falls, Texas, Richie received academic training in and worked on affordable housing policy issues for over 30 years on the local, state and federal level as a legislative staffer. As professional lobbyist, he works affordable housing issues on a pro bono basis. This year also marks his 20th anniversary of service on the Board of Commissioners for Housing Authority of the City of Austin. He has served two terms on the NAHRO Board of Governors as Parliamentarian. As NAHRO Senior Vice President, he assisted with the establishment of the NAHRO Merit College Scholarship program. Richie has also served four terms on NAHRO’s Commissioners Committee and led the rewrite of the Commissioner’s Handbook. Further, he was among the first Commissioners to earn NAHRO’s National Certification for Commissioners and is certified to teach the Commissioner’s Ethics and Fundamentals courses. He is also a NAHRO Fellow. He has earned numerous industry awards for his service and last year he was inducted into the Texas NAHRO Hall of Fame.